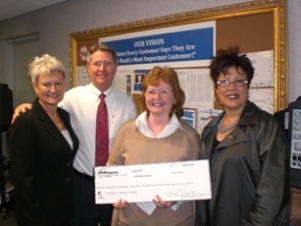 On May 13, 2009, the American National Bank team was proud to present a check to Marti Forman, CEO and Executive Director of the Cooperative Feeding Program of Broward in the amount of $4,262. Donations made by our customers and bank team were matched dollar for dollar by the bank. With this donation, the program can buy over 11 tons of food that will feed 61 of Broward County’s homeless for one year. Together we can make a difference in someone’s life! We would like to extend a warm thank you to our customers who so generously contributed to this important cause. You are currently browsing the American National Bank News Updates blog archives for January, 2010.